Perhaps the best dollar I’ve ever spent was on this game. Now go ahead, think about that. When was the last time you said you spent only a dollar and were completely satisfied. Even a bottle of soda generally will cost $1.25 or more and those are only temporary. 16 oz. only lasts so long and if you share it with someone, your reducing your satisfaction level; however, sharing this game actually brings your satisfaction level over 9000! Unless I was in the middle of the desert, dehydration enveloping me in its death grip, that dollar could be no better spent. But there’s no vending machines in the middle of the desert anyway, so I maintain it was my wisest dollar purchase ever. There’s no doubt that the zombie apocalypse is coming (see ref. Zombie Survival Guide) Or in some cases is already here. I’m pretty certain that everyone in Canada is a zombie. Beware our neighbors to the north! But I digress. So with everyone’s rising interest in the oncoming zombie hoard, pop media in all its forms became flooded with zombies. Call of Duty: World at War and Left 4 Dead weren’t the first games to include killing tons of zombies, but they were perhaps the most influential of this generation. Thus opening the gateway for Ska-Studios to develop, I MAED A GAM3 W1TH ZOMBIES 1N IT!! 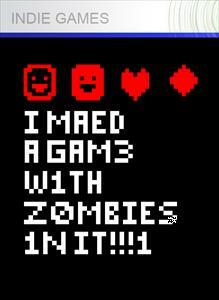 !1 Around the same time, another game simply named, Zombie Apocalypse was released. They both offer a similar style of gameplay, but IMaGWZ1i is by far the most gratifying shoot ’em up out there. Especially if you use a cost vs. fun ratio. Please refer to chart A-1 which I made using MS Paint. As you can see they are pretty close in fun factor, hovering somewhere between a 7 and 8. However, Zombie Apocalypse costs 800 Microsoft points ($10) and IMaGWZ1i is 80($1), IMaGWZ1i has an astoundingly high positive CvF (cost vs. fun) differential of +6.5, while ZAs CvF is actually negative. That means IMaGWZ1i is nearly 217% more fun per dollar! Even though Zombie Apocalypse came out only a month later, I’m going to claim that they completely copied IMaGWZ1i, and with their larger budget, were able to work on it an accelerated schedule to get the game released in just over a month. They both share the same concept; kill wave after wave of zombies. They both have a similar weapon loadout; machine guns, flamethrowers, shotguns, etc. IMaGWZ1i just executes it better. Now despite what I may have lead you to believe, this game really isn’t about the zombie apocalypse, but there are definitely zombies in it, and you must kill them, all of them. You get thrown in without any explanation of what to do, but do you need one? Controls are simple, left stick is movement and right stick shoots. I really like this control scheme. It’s been around awhile but more and more games are using it now. The ease of its style makes it easier to just get into the combat and have fun without being bogged down with too many commands. There are plenty of powerups to help keep up the fight against the hoard; there is almost never a moment when there isn’t a new powerup popping up somewhere on the screen, often there are a dozen or so, and they are all necessary because there is also never a moment when the screen isn’t littered with things that want to kill you. And thats pretty much how you play the game. You spend your time running from powerup to powerup, dodging and killing as many zombies as you can in between. Taking graphics out of consideration, the visuals are quite amazing. That is to say, if you were ever uncertain if a game could give you a seizure, this is the game to play. Seriously, this is a warning. If you have any friends with epilepsy and you want a good laugh, invite them over to enjoy up to 4 player co-op. Without giving too much away, there are far more enemies in this game than just zombies. After the first wave, everything becomes complete nonsense and it only gets worse as time goes on. Confusion takes center stage pretty quickly; you’re not sure what’s happening and are rarely able to accurately locate yourself on the screen and if you are playing with 4 people, it’s utter chaos, especially when anger mode starts. The soundtrack is awesome. You can check it out yourself here. It’s a catchy little ditty about the game itself and often I find myself playing just to hear the song. On a side note, an odd point about the game is that the soundtrack is as long as the game itself. The game just ends. You either die or survive the predetermined time limit and are awarded your final score. This is by no means a strike against the game. It has just the right amount of gameplay to not get annoying or boring. If it dragged on any longer than it does, it would become sorely tedious. Whether it was because the developers had the keen sense to see ahead, or because of budget concerns or what have you, this is the most neatly wrapped up game you can buy for a dollar. And you should buy it…now… it’s only a dollar. Please feel free to leave any comments/suggestions/ideas/yell at me. A like on facebook would be awesome, but subscribing would be more awesome! 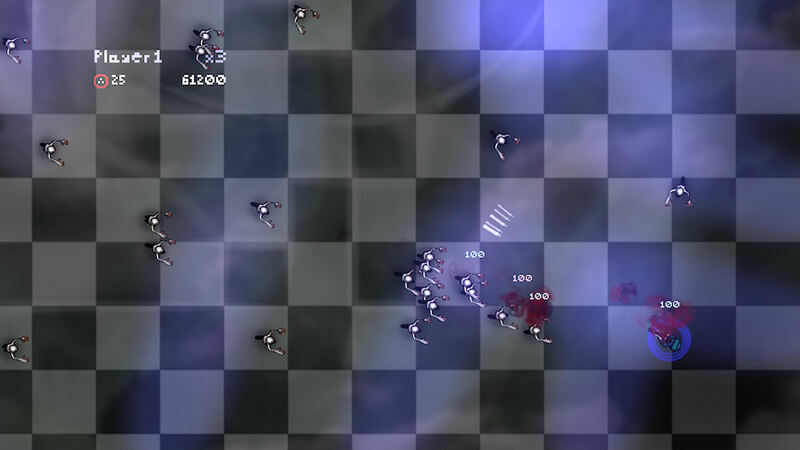 Posted on June 24, 2011, in Indie Games and tagged apocalypse, co-op, i made a game with zombies in it, indie, microsoft, ska-studios, smash tv, XBLA, xbox, zombies. Bookmark the permalink. 7 Comments. 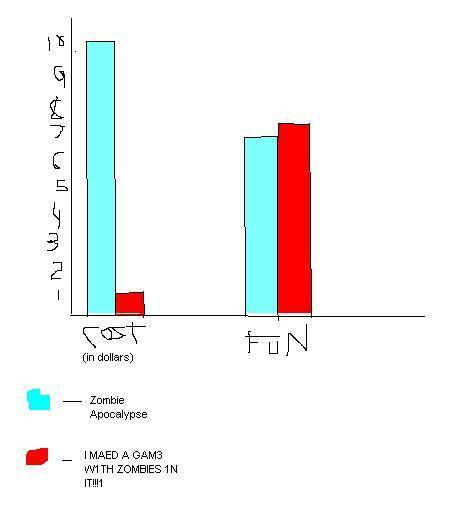 I love the chart, I haven’t played zombie apoc. but I do love IMAGWZ1I. For me, graphics don’t matter as much as the game experience and if that is the case then IMAGWZ1I gets an A++ from me. who has shared this impressive post aat at this place. Research has shown that fun factor of Smash TV in the arcade is 12,500 tonight’s over IMAGWZII, increasing a further 16% if one of the joystick is partially broken. All for a measely $.25, how can you beat that?